I’m fresh back from a trip to Dortmund in Germany, I have to say, not the most beautiful place I’ve ever been, especially when there’s no opportunity to leave the airport but I came back with more than I left with; a German drone operating license and a tummy full of pretzels! The rules in Germany changed recently, it used to be the case that with a UK license, you could apply to fly your drone in Germany for commercial purposes on a temporary permit but this is no longer the case. We’ve got a couple of shoots in the diary and ever wanting to increase our license portfolio, we thought let’s head out there and get tested. This means we’re now able to fly drones up to 25kg’s in weight for commercial purposes in Germany. Did you also know that we’ve got permanant permissions in France, Spain, Norway, Italy and of course the UK and have flown in over 30 other countries worldwide? If you need a specialist in international drone operations for your project then get in touch with us today! Great to see so many projects coming out with our friends over at Jaguar and loads of fun working with Foxtrot Papa for a project in France. Check out the new release here! We're really pleased some of our recent work for VICE Impact has been launched. In collaboration with Evian, VICE contacted us and asked us to film their new series of videos exploring circularity. Evian is a company aiming to be completely circular by 2025. If you're not sure what circularity is, check out the link below to explore the documentaries we were a part of. It's always exciting to see work come out that we've been a part of but when you've been working on the project for over 2 years, it's even more exciting! On the 2nd June 2018, The Macallan will open the doors to it's brand new home. The new distillery is a huge £140 million pound development made out of more than 380,000 pieces and has one of the most complex roof structures in Europe. PHIX London was the perfect production to make this beautiful project stand out. Our first visit up the the Macallan was way back in November 2015 - back then there really wasn't a lot to look at! A concrete shell sat in the landscape mostly covered in snow from the bitterly cold Scottish winter. I think to date, it's still some of the coldest and worst weather I've ever flown in. This was so long ago, we were still filming with the S900 and Panasonic GH4, after seeing some of the content next to the RED Epic 6K footage it looks fantastic! With the right light this camera was pumping out some amazing shots. The HDMI converter in those old gimbals definitely didn't like the cold though... some will remember! A few more visits took us through the winter of 2015/16. The mash ton went in and the walls went up. Then we got the Freefly Alta opening up the door to RED Epic filming and starting our heavy lift capabilities. The first couple of trips with the Alta housed the GH4 camera still and we weaved the drone through the roof structure which looked stunning as it was being built. Then something cool happened! We flew our first RED Epic 6K! And this was definitely the project to do it on, flying over the roof structure and watching the sun pop as we passed through the undulating mounds on the roof looked seriously cool. We headed down to the barley fields and got some epic shots with a 14mm lens with the barley rushing past the camera and rising up to reveal the combine harvester working away in the field. The Spey River providing the perfect backdrop for these shots. We really started to get the hang of the RED Epic flying... visiting the Highlands quite a few more times and every time, flying much bigger and better lenses, figuring out how to fly the camera for longer, smoother. The results were getting seriously stunning. We now pretty much exclusively fly the RED on our heavy lift drones, it provides us with such stunning images and for us, the camera body so perfectly integrates with our Freefly gimbal systems we use to stabilize them. Here's a few more BTS shots for you to have a look at before you get to the finale.. one of the key pieces of content to come out of the trips which is below. Well... writing this after my 5th time out to Italy this year makes me wonder whether it might be best to move our office out to Italy and start learning the language a bit better... much better in fact! Shooting with Steve Sutcliffe creating one of my favourite series of video's, Europoe's Greatest Driving Roads always seems to be some of the most fun you could wish to have on a shoot. It's the perfect combination of fast cars, beautiful locations, great company and great toys! This trip proved to be no different. Heading an hour outside of Rome straight off the back of our Roborace Formula E shoot (video to come shortly) we came to the via Campocatino, an 18km winding mountain road leading up to a ski resort which is virtually abandoned in the summer months and the perfect stomping ground for our latest toy, the all new Ford Fiesta ST.
For this shoot, the DJI Inspire 2 had to be the drone of choice, it's super fast, super nible, easy and quick to set up and doesn't need to be fully packed up to move half a mile down the road to the next shoot location. I think for all of these shoots moving forward, it's the perfect tool. We also had the opportunity to mount a RED Epic onto our Movi Pro and Black Arm for some of the tracking shots. Tracking is something we're really starting to move into and we're super excited to see the results looking so good from this shoot. We'll update you further with some more content from this but there's a lot more to come! For now though, have a look at the video below and do comment to give your feedback. We've been working with London based production company Mr White on a series of videos for prime time TVC slots on National Geographic for automotive car brand Subaru and one of their outdoor do it all vehicles. The series of videos aims to showcase the outdoor lifestyle of the typical Subaru car owner and shot the car as a go anywhere, do anything reliable workhorse! Take a look of the 'long form' commercial below! It's been a year in waiting but it's been worth the wait. This new TV commercial will hopefully be getting a lot of air time! Shot on location just outside Benidorm in Spain with Natalia Vodionova and crew - March 2017. Last May we were given an amazing opportunity to travel to Venice with OFTV and shoot part of their new feature film for Damien Hirst. The crew were amazing from start till finish and the film has been realesed on Netflix! Make sure you head over to Netflix to check it out! At the end of last year we had the absolute pleasure of working on a series of short recruitment films for the Royal Marines. Working alongside DOP Adam Barnett and Director Jack Retallack we knew this shoot was going to be a memorable one. 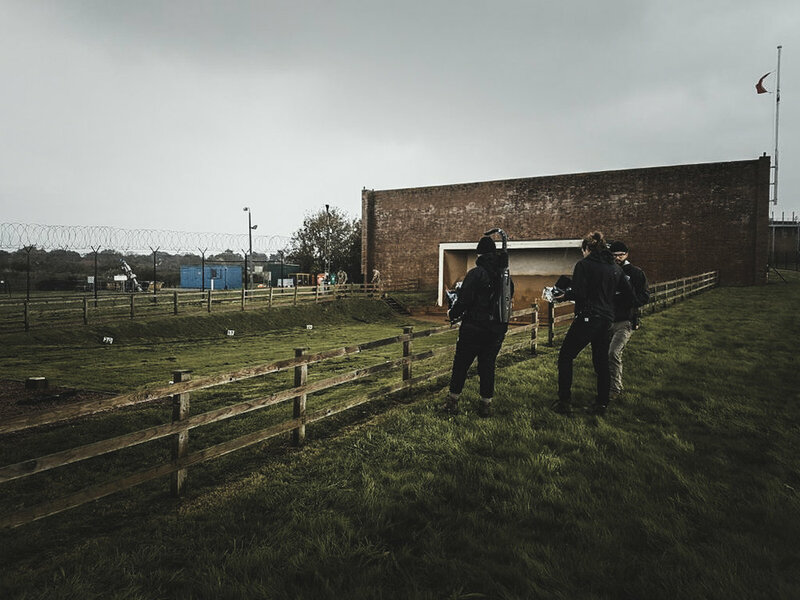 Our role was to shoot the aerials whilst the new recruits underwent some of the toughest mental and physical challenges imaginable. Over the course of the next few days we attempted to capture the rawness of what it was like to be a Royal Marine recruit. We were super impressed with our Inspire 2 and X5s combo on this shoot, being able to set up and fly within minutes was essential and time and time again the Inspire 2 proved it was the right choice. Looking at the footage I think you'll agree it works really nicely with the stunning Amira footage shot by Adam and his team. It's awesome to see these films being released, make sure you keep an eye on the Give Me Sport facebook page from the next film. All in all this is one shoot we will remember for a long time! At the end of last year we travelled to Hong Kong to shoot an exciting new concept piece for Roborace. Hong Kong is one of those places you need to see to believe, it's skyscraper after skyscraper as far as you can see! Awesome! The shoot saw Formula E & Motorsport presenter Nicki Shields race the DevBot on the tight street circuit in Hong Kong. It was brilliant to work with Nicki and see how dedicated she is to supporting new technologies. Find out what happened in the film below.